Due to my… passion… for keeping my phones and other touch screen gadgets covered by thin sheets of plastic, I have been a target of friends either threatening to peel my screen protectors off or friends actually peeling my screen protectors off (I’m looking at you, K-Bed, Da Heat and Two Sheets.) Because of this, I try not to make a big deal about how friends should touch my gadgets anymore, for fear they’ll sense my anxiety, become curious as to the cause, then exploit it (as friends do.) Sadly, it’s not really a secret at this point, and I sense this strip will do nothing to help matters. DAMN! Yer like the First Ninja with a totes rockin name! love it. You GO girl! There’s not really any secret ninja voodoo to it (but, shhh! Don’t tell anyone!). wait, the emblem on Coolhand shirt…is that the White Hand of Isengard?! Is your brother-in-law secretly one of the Fighting Uruk-hai? Is his shield broad, his armor thick? ha! how cool would it be to have an uruk-hai as a brother-in-law, Jed!? Wow! My second “first” in a row! I know how what you mean about friends exploiting your anxieties. I have mild OCD which manifests in a few weird and wonderful ways; one of which involves traffic cones. NEVER mention to students, fellow cadets or friends that you have an aversion to seeing said cones ‘in distress’ (knocked over, up a tree or generally out of their natural habitat). I believe it may be one of the reasons I no longer drink; there’s always some drunken idiot who decides it’s a good idea to “liberate” (‘though I’d say “abduct”) a traffic cone. As for the cadets, well… I had a sadistic NCO who figured that normal punishment details wouldn’t be as effective with me as ordering the other cadets to knock down every cone they saw for the rest of the day, knowing that I’d HAVE TO PICK THEM UP. The rest of my friends just like seeing me twitch. …Is it really any wonder that I’m afraid to go outside? *twitches* My friends are evil. and your traffic cone OCD is awesome. i won’t tell you then that i “liberated” a cone on one drunken night long ago. (but i released it soon after.) and SOMEone (not sure if it was my neighbor or sister) liberated not only a traffic cone, but a “wrong way” sign that stood in the corner of my room throughout my childhood. sounds like you need to use your ninja skills to discover and exploit your NCO’s and friends’ OCDs. heheh. My three-year old has a deep love for stickers. So I’m not worried about her peeling things off her silicon siblings as much as I am discovering that she’s decorated them. All over. With little Tinkerbells. Again. Thanks, Grandma . . .
Oh god. My father, sister and I are the same way. Luckily no one’s pulled any plastic off, but my god, do they threaten. i’ll have to remember that the next time my friends threaten to strip the screen protectors from my devices, Mugdha. never underestimate the power of puppy dog eyes! Oh wow. I want to cry for poor JefBot right now. I would have cried had that been me. And Pixie does not cry at the drop of a hat. Sappy movie…it’s been known to happen (tell anyone and I will deny it!) but in general situations…not so much. But this would have reduced me to tears. OOops…wow there went a tangent. ANYWAY Is it me or did JB get thinner and paler in the second panel? He just looks so distressed. AWESOME as usual Jeff. And CF…You evil bastid….I think I love you. i wish you worked at my office – some of the people there are germ factories! HR had to put signs up about what to do if you have a cold ‘cuz people were sneezing and touching and getting their viruses all over the place. yes! the blood in bot’s face did drain a little in that second panel, he was so horrified. again: the Cornfather’s a mean, mean man. aagh! never let your phone go naked, Leithal! just the thought of your scratched screen gives me the heebie-jeebies. Hell yeahs, I know that reaction pretty well. I keep the protective foil over my gadgets as long as it looks ok, but when its starts to peel off its time to get rid of it. i live by that rule too, Eddie, at least for some of my electronics. like the plastic stickers on my XBOX 360 and Wii controllers stayed on until they got dirty or started peeling, then they came off. but a screen protector should always stay on! run, Rinthia! run like the wind!!! Ohhhhh, the Corn and the Cool are in cahoots! could be a sign of the Apocalypse, Pearl! if you ripped off a screen protector in front of me i’d probably have the same exact reaction as jefbot here, Shanna! HA HA HA HA!!!! OUTSTANDING! I’m serious, that was brilliant. I LOVE LOVE LOVE the second panel- You have so many emotions in that face it’s hard to believe this is a drawing! After all that work getting that plastic cover just right too… I’m so that guy who rips off protective stickers from electronics… not out of evilness- just because I have an OCD! Amazing! glad you liked this one so much, Funnyshaffer! and it sounds like you have the exact opposite OCD as i do. heheh. Heh heh. Now, it’s not like me to take a screen protector off (I still have the original stickers on the front of my DVD player…bought in 1998), but as we know, I’ll at least think about doing a lot of crazy stuff for a $1 dare!!!! That might be a $2 dare. That’s super funny, bot. You and your plastic. To all the jefbot fans out there, just so you know…jefbot STILL has the plastic around the flat screen tv he bought a few months back. In fact, there’s plastic on almost everything he owns. Sometimes I feel like I’m back at my Italian Grandmother Rosita’s house in South Philly sitting on her plastic covered couch and turning on her plastic covered lamps. Back to the strip, bot…it’s really good. I love all the character’s facial expressions. Especially bot’s in the second panel. And the whimpering of “kill you both” line is priceless. Great job!! Oh and I voted in round 3…Good Luck! thanks, buddy! JEFbot’s taken the lead so far! cover the ipad in bubble wrap.it can be protective and entertaining all at the same time. and besides…who doesn’t love bubble wrap?? second panel is awesome. Terror face jefbot is instant win in my evil book. At least I can get good laughs out of Apple’s evil contraption. Really, jef. You’re in for a lot of trauma and pain and stress. i’m happy you enjoyed jefbot’s horror in the 2nd panel. oh, wait. i meant, i’m afraid of you enjoying jefbot’s horror in that 2nd panel!!! if Apple’s contraption’s so evil, shouldn’t you like it!? and don’t worry, jefbot will inflict some emotional suffering on the Cornfather and Coolhand in future strips, no doubt about it. Bwuahahahahahahahahah! You’re practicing your own evil laugh of doom? I’m flatered! Remember to open your eyes real wide while doing it. It helps freak people out! awwww… thanks, Ebony! it’s always nice to read positive comments like yours. i love Hallmark card moments!!! so far i’ve managed to keep my iPad safe, and it came along with me for the ride along the entire stretch of California from north to south. keeping my fingers crossed it stays pristine. i will totally let Funnyshaffer know you enjoyed his work on “Housewives”! he has some cool stuff in the works as far as that goes, but i don’t think i can say what it is just yet. *gulp! * peeling it off now, Rod! actually, i might be removing it soon for aesthetic reasons, but i’ll double check to make sure it’s not covering any vents or anything important. My dad did the same thing to me. Notebook in my case. ARGH…! Ripping of the film for someone else’s device? That’s a kicking offense round these parts! Kick kick! many thanks for the many votes, Alesa! glad to hear JEFbot’s doing well this round. this tournament has had a way of changing numbers suddenly, though, so i wouldn’t be surprised if my competitor made a last minute comeback. keeping my fingers crossed. Hilarious! You must be related to my dad, Jeff. OMG JB This really hit home. I am just like you in that I try to keep my stuff like new. It is because of this that when I got my 3GS I was able to sell my 3G for $400. I hope to do the same thing with my 3GS now that I have the 4. Protection is the only way…this is what my parents has always told me…make sure you use protection! if i can get $200 for my like-new 3G, i’d probably take it, Slave1! unfortunately, i rarely sell my stuff. i likes to keeps it, my preciousssss. 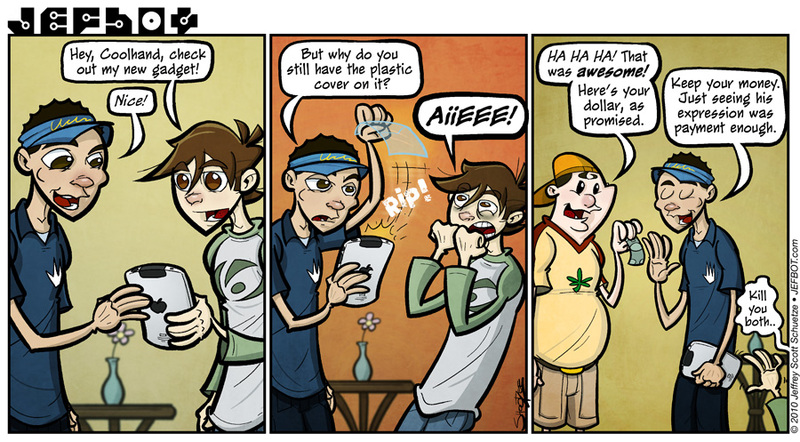 dude, the plastic, so not cool… but I’da done the same thing just to see your face muahahahah! i can see it now though… someone handles your precious iPad… they’re fingernails just finding the plastic sheet’s corner… and then POUNCE to retrieve the iPad! Sure you’re one friend down but the plastic stays on right? rest assured, i keep a SHARP eye on people playing with my stuff, Steve. but yeah, especially after this strip, i’m going to have to keep at-the-ready so i can POUNCE! if they’re really my friends, they should understand, right? yeah, i’ve bought a ton of screen protectors, Char, and i have at least one extra iPad protector i’m probably going to give to a friend ‘cuz i can’t believe he lets his iPad go around naked. and as much as i’ve heard that iPhones are hard to scratch, i just can’t bear to go unprotected. but yeah, it’s starting to peel and looks gross. might have to buy a new sheet for it. Meh. Have you tried the experiment yet? not yet. still haven’t found any strawberry Quik. Doesn’t have to be Nesquik. It can be just regular strawberry milk made with strawberry syrup. You can get it at Publix. dats just so wrong in many ways. right!? the Cornfather deserves punishment!!! I have an obsession with peeling those off….good thing you don’t know me! Ouch, for you thats like a kick in the man-hood. We keeps it real, too, Jefbot. Even our cars keep their OG stickers.